Great Western Bancorp Inc agreed to a 10-year lease for 10.9k sf of space in Chandler, AZ. The lease value was not disclosed. 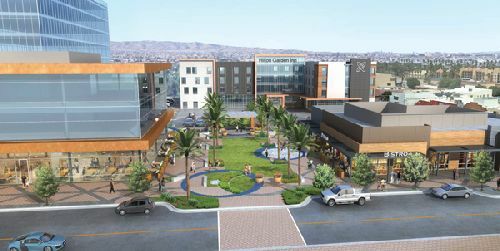 The deal is at 180 South Arizona Avenue, within the first phase of New Square Chandler, a three-building, 175.7k sf mixed-use development currently under construction. The tenant will be located within the project’s three-story, 50.4k sf building and will use 2.5k sf for a new bank branch on the ground floor, and 8.4k sf of second floor space will be used as its regional headquarters. Move-in is anticipated for January 2020. New Square Chandler is located directly across from Chandler City Hall and is at the corner of S. Arizona Ave and Chicago St. In addition to the three-story office and retail building, the project’s first phase will include a 109-room Hilton Garden Inn and a multi-tenant office building. The project will also include an event square, green space and walkability to other downtown spaces. Laurie Sandau with Avison Young represented the tenant. The landlord, Spike Lawrence Ventures I LLC, a joint-venture owned by Spike Lawrence of Chandler, AZ and HCW LLC of Phoenix, was repped by BD Baker Company.